This is one of the best places on the ribbon reefs for a night dive. The diving at challenger bay during the day is also very good, but my most memorable dives here have been night dives. Challenger bay is a dive site that has many interesting sites to see in addition to the sea life. Challenger bay features a fantastic shallow area great for looking at the multi-colored corals that pack the area. Along with the corals, there are many varieties of angelfish, parrotfish, wrasses, and triggers. It is also common to find large batfish under the boat looking for an easy meal. 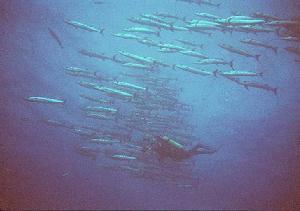 One of the known inhabitants is a large barracuda. This barracuda is sometimes seen during the day, but is most often seen at night. During night dives, this large barracuda will move along side a diver with a light. As this is a large animal, it can be quite frightening for someone not accustomed to an animal this large so close. Do not shine the dive light in the barracuda's eyes. It will leave. Instead, shine the divelight on the body of the barracuda. This will enable the divers to see the barracuda and not frighten him away. As the dive progresses, eventually a diver will shine thier light on a small fish. When this happens, the small fish is blinded. The blinded fish is no match for the smart and fast barracuda. When diving on challenger bay during a night dive there is something else to remember. There are many parrotfish in the area. A parrotfish makes a mucos cocoon every night to sleep in. The mucos cocoon is to mask its' scent to other predators (such as the white tip reef shark). Do not shine a dive light directly on the parrotfish as it may become frightened and bolt from its' cocoon. Since the parrotfish can only make one cocoon each night, a parrotfish frightened from its' cocoon may soon be a meal. On one particular night dive, my buddy and I were the only divers in the water. My dive buddy was leading the dive. We worked our way along the southeren end of the reef, finding lobster and sleeping fish. As we hit our turn around point a strange thing happended. I noticed that my dive buddy was ALOT closer than normal. I signaled to her to see if she was O.K. and she responded that she was. Although she indicated that she was O.K, I noticed that she maintaind a close distance, keeping herself between me and the reef. We continued our dive and reached the boat after an uneventful dive. On the dive deck the first thing my buddy said to me was "Did you see the shark?" As I had seen a few sharks cruising in the deeper water during the dive I reacted with amusement and told her that there were several sharks with us during the dive. It was then that she told me that she came face to snout with a large shark at our turn around point and was spooked with this unexpected close encounter. The best way to dive challenger bay is to dive in a "T" pattern. Ask the dive master about the direction of the current and start at the mooring line by swimming against the current. The mooring line is tied to a coral head that makes for a good reference marker. After one third of the air us used, turn back and let the current take you back to the mooring line. Pass the mooring line by a short distance and work up into to shallow area of the reef. Work your way back to the mooring line following the reef system in the shallows. The shallows provides an excellent area to perform a safety stop while enjoying thre scenery at the same time. It is always a good idea to work up to a shallow area for a safety stop. After many days of diving a safety stop is an excellent way to minimize any diving related maladies from spoiling your diving holiday and enjoy the surrounding scenery. If the currents allow it, there is another notable item about challenger bay. At the southern end of the is an enormous coral polyp formation. This formation is larger than the boats that visit the ribbon reefs and many thousnads of years older. The formation streaches from about 60 feet up to 20 feet and is over 50 feet accross. This is a sight not to be missed .